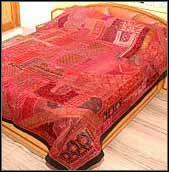 Textile Tour - Rajasthan & Gujarat:. Arrive Delhi by an international flight. Met upon arrival and transfer to the hotel. Morning at leisure. Afternoon half day combined sightseeing tour of Old and New Delhi. Overnight stay at hotel in Delhi. Early morning transfer to the airport board flight for Jaipur. On arrival at Jaipur transfer from airport to hotel. After breakfast, excursion to visit AMBER FORT with Elephant ride. Afternoon visit to Sanganar village to see the traditional wood block printing and tie and dye fabrics. Also visit the paper factory. After breakfast, half day city sightseeing tour visiting the Hawa Mahal, Janatar - Manter and the city palace musuem. Afternoon excursion to Galta temples and also see the Rani Sisodia Gardens. After breakfast, drive to Kota via Bundi - for the distance of 242 kms. Bundi - the older of the two 'fire- born' kingdoms of Hadoti, was founded by Deva in 1241, while Kota became an indepandent state in 1624 under Madho Singh. Visit the Chatar Mahal frescoes and Raniji Ki Baoli. Overnight at the hotel in Kota. After breakfast, drive to Chittaurgarh via Bhilwara - the city of textile industries. Chittaurgarh - the 7th century fort of Chittor stands on a craggy hill 118 kms east of Udaipur. Visit the palaces of Rana Kumbha dating back from 15th century and the Tower of Victory. Overnight at the hotel. After breakfast, drive to Udaipur for the distance of 118 kms. On arrival check into the hotel. Afternoon, half day tour of Udaipur visiting the City Palace, Jagdish Temple, Fateh Sagar lake and the Sahelion Ki Bari. Overnight at the hotel. Morning excursion to visit Eklingji temple, 22 kms from Udaipur and the temples of Nagda.Afternoon visit the Puppet musuem and the Local Handicrafts centre known as " SHILPGRAM". Overnight at the hotel. Morning drive to Jodhpur for 275 kms. enroute visiting the world famous Jain temples at Ranakpur. The 15th century temple of Ranakpur which have 29 halls supparted by 1444 pillars without a parallel in the world, and no two pillars look alike. On arrival at Jodhpur check into the hotel. Overnight at the hotel. Morning sightseeing tour visiting the Mehrangarh Fort, Clock Tower market and the Mandore Gardens. Afternoon visit the local market to see the special Sarees fabrics and also the leather Jooties or shoes made with embroidery. In the evevning transfer to the airport to board flight for Ahmedabad. Upon arrival transfer from airport to the hotel. Dinner and overnight at the hotel. 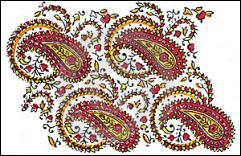 After breakfast, proceed to visit block printing and Kalamkari work on roadsides in Mirzapur. Then proceed to visit textile museum & Shreyas Folk art museum. Overnight at the hotel. Full day excursion to visit Patan and Pethapur villages. 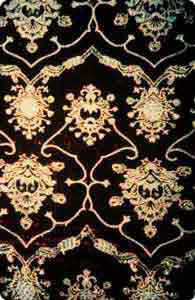 Patan is famous for Masharoo and Patola Saree weavers and at Pethapur for wooden block makers villages. Dinner and overnight at Ahmedabad. After breakfast, proceed to Rajkot and on arrival transfer to the hotel. Afternoon visit to Rashtriyashala for single IKAT saree weaving centre only a place in city. Overnight at the hotel. Full day excursion to Jamnagar to see the Bandhani Saree with technique of tie and dye ond Gharchola Saree. Overnight at the hotel. 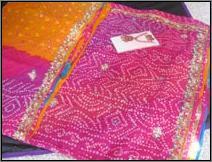 After breakfast, proceed to Bhuj via Dhudhai and visit the AARI embroidery technique. Afternoon visit tie and dye technique on Silk fabric at the place of an Mahmed Alisa National Award winner. Overnight at hotel. After breakfast, proceed to NIRONA village with packed lunch famous for its Ragan art technique on cotton fabric, later proceed to Bunny village for intricated embrodidery work on cotton fabric and leather. The villages to be visited are Bhirandiyala, Hodka, Dhordowandh and VAP. Morning free for independent activities. 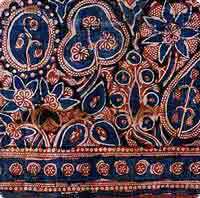 After lunch, proceed to Rajkot via Dhamadka village famous for its AJARAKH printing and Batique. Overnight at hotel in Rajkot. After breakfast, drive to Ahmedabad and on arrival transfer to the airport to board flight for Delhi. On arrival transfer to the hotel. Overnight at hotel. In time transfer to the airport to board flight for onward journey.